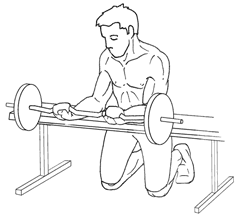 Kneeling before a bench, grasp EZ-curl Bar with overhanded grip (palms down) and rest forearms on bench with wrists extending out over the bench. Lower the wrists and then raise them back up. Using an EZ-curl bar can help alleviate wrist pain you may feel with this exercise. However, loosening your grip on a straight bar should also do the trick. Reverse Wrist Curls target the wrist extensor muscles which are the muscles at the top of your forearm (if holding your forearm out palms down). You can perform the exercise in a variety of ways: Kneeling before a bench (as shown above), sitting on a bench with forearms stuck to your thighs, straddling a bench and bending over so that the forearms are on the bench. For best results, you just want to try and keep your wrists and elbow at the same height. 15-20 reps the majority of the time, trying higher or lower reps on occasion. (The forearms tend to respond better to high reps for most people). Standing Reverse Wrist Curls – With barbell hanging in front, overhanded grip, moving wrist up and down in same motion. Behind-The-Back Reverse Wrist Curls – Standing, with barbell behind the back, overhanded grip, moving wrist up and down in same motion. Machine-Based Wrist Curls – Cable and certain lever machines allow you to perform reverse wrist curls. Wrist Rollers (a bar with a weight attached to a rope, you grab the bar with both hands out in front of you and roll the weight up and down on the bar) offer a decent substitute for directly targeting the hard-to-target forearms. Hammer Curls and Reverse Barbell Curls are very good options as well. The Guide’s online calculator that calculates both your body fat percentage and lean body mass. (Main Page) Learn about the important parts to solid programs and how to put them together into a mass gain training program.